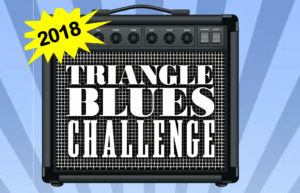 Durham, NC – The Triangle Blues Society announces the 2018 TBS Blues Challenge call for entries. Deadline for applications is Sat., July 21, 2018. The TBS Blues Challenge will take place on Sunday, August 5, 2018 -time to be announced – at the Blue Note Grill in Durham, NC. Tickets are $10 for non-TBS members, $8 for TBS members, and are available at the door. Qualifying bands will be notified via email provided on application and announced on the Triangle Blues Society website, www.triangleblues.com, on Sunday, July 28, 2018. TBS sponsors the annual Blues Challenge and works with winners throughout the process to raise the money to support their travel to the IBC. Triangle Blues Society (TBS), is a 501(c3) all-volunteer non-profit organization that has been an affiliate of the Blues Foundation since 1996, working together to support, promote, and grow blues music in the greater Raleigh-Durham North Carolina area. ← TBS 1st Sunday Blues Jam / WILLFEST VIII this Sunday!